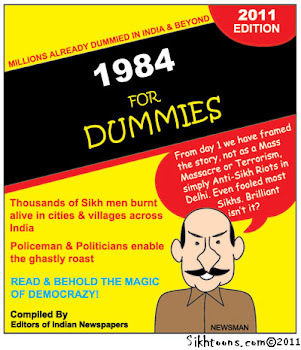 THE ROAD TO KHALISTAN: How Annoying! I am never sure how to react to this kind of nonsense. Can anyone really believe that an outfit like Al Qa eda, totally male supremacist, could ever be associated with an egalitarian religion like Sikhi? Unfortunately, people see stuff like this and take it for truth! Again, I have no idea what to do except just to state that it's silliness, pure silliness of the most dangerous kind. Of course, the government of India considers me a terrorist because I support the establishment of our Khalistan. This in spite of the fact that I have never advocated violence and even the Indian government would agree that my one real act of violence was in thoroughly justified self- defence. Ah, well. My husband keeps telling me that I don't need to save the world, in fact, I cannot save the world. I just toss a 'Chardi kala!' back to him and ask, 'If not me, who?' He glares at me, but doesn't answer. Ah, well. The Khalistan ribbon is here just because this nonsense annoys me. 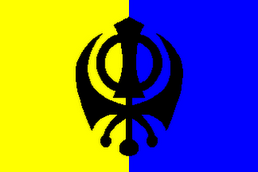 KHALISTAN ZINDABAD!! Members of the Sikh community are in fury over a BBC Radio 4 programme which linked Sikhs with Al Qaeda. The BBC Radio 4 programme 'File on 4' claimed that Sikh Gurdwara's in Britain are sending money to India to fund the activities of Sikh militants who are pushing for a Sikh homeland called Khalistan. Many Sikhs feel that the programme lacked "balance" and according to bhangra artists Tigerstyle, it "attempted to sensationalise local gurdwara politics". Editor of Sikh newspaper The Sikh Times, Gurjeet Kaur said the programme was "irresponsible journalism", adding "it is these irresponsible actions that destroy trust and question relationships. The Sikh community has worked arduously to become model citizens of Britain. Not only have they contributed financially they have and are equally contributing socially to the welfare and future of this country." Some members of the Sikh community told 'File on 4' they fear the extremists could use Sikh temples the way radical Muslim cleric Abu Hamza radicalised the Finsbury Park Mosque in London. Indarjit Singh, Director Network of Sikh Organisations said: "In my capacity as Director of the NSO, I have already made my comments known to Paramjit Dhanda the Minister responsible for the Faith and Community Consultative Forum, and earnestly request the British Sikh Consultative Forums (open and closed) and other Sikh groupings to do the same." Gurmukh Singh, Administrative Secretary of the (open) British Sikh Consultative Forum expressed concern of the programme: "I saw this programme which portrayed Sikh concern for the families of Sikhs killed by the Indian State as something sinister. Truth was stretched almost beyond recognition to portray a negative image of Sikhs by suggesting links between Sikh and Muslim extremists! The programme lacked balance because questionable comments were made by Indian 'security experts' but Sikhs were given no opportunity to respond." The BBC defended the programme adding: "The programme was presented by Amardeep Bassey an experienced and respected Sikh journalist and included comments from a wide range of agencies and experts. It reflected the concern expressed by the Indian police that militant groups trying to revive the violent campaign for an independent Sikh homeland, are being given support from outside the country, including the UK. The issues we reported are of obvious public interest both to Sikhs and to the wider public and we were at pains to make it clear that we were focusing on the activities of a minority of people."